Firstly, we must acknowledge that May is selling false promises even to the people she supposedly cares most about — the white working class, the left-behinds, the just about managing, the ‘ordinary British families’ the Tories are suddenly so concerned about. Yes, many of these people are angry and that’s why many of them voted for Brexit. But how can May claim to fighting their corner when she was a senior member of the last government, which oversaw the stagnation of wages, the growth of poverty and homelessness, the expansion of the NHS deficit and the depletion of much-needed benefits and public services? 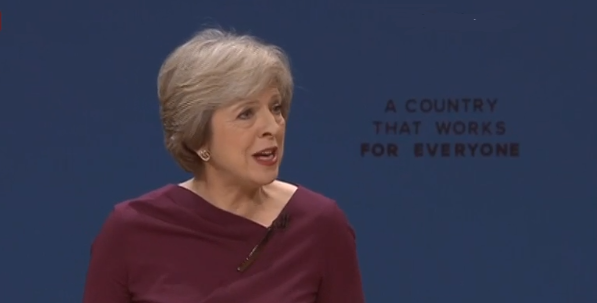 We must be very clear that this speech contained no substantive policy to redress any of that, nor did any other part of the Tory conference. Philip Hammond abandoned the deficit target, but remains committed to the cuts agenda. Jeremy Hunt threatened to kick out foreign doctors, but offered no solution to the yawning deficits that are crippling the NHS. Amber Rudd promised that jobs would go to British workers instead of migrants, but they are doing nothing to ensure that those jobs are reliable, decently paid and fulfilling. May promises education reform — but still plans to open more grammar schools. Of course, certain policies are welcome, such as the promise to put employees’ representatives on company boards and to crack down on tax avoidance. But they simply aren’t enough. In the coming years, the poorest communities in Britain are only going to get poorer as the effects of Brexit take hold, and the May government has no plan to tackle that. However, the truly frightening aspect of this speech was its divisiveness, its aggression towards anyone who doesn’t fit into the prime minister’s defintion of ‘ordinary’. She insists that these people who ‘find your patriotism distasteful, your concerns about immigration parochial, your views about crime illiberal, your attachment to your job security inconvenient,’ refusing to accept that progressives and internationalists are ever acting in good faith. Indeed, May reserved particular venom for ‘those activist, left-wing human rights lawyers [who] harangue and harass the bravest of the brave’. By which she means lawyers who believe that it’s wrong to torture, to illegally detain, to kill unlawfully. Those who insist that any British soldier who does commit abuses is not patriotic, is not ‘the bravest of the brave’ but is a disgrace to his or her country. That’s not just an attack on the affluent who travel the world for pleasure, but on the stateless refugees currently seeking safety in Europe, and on the millions of immigrants and descendants of immigrants who live in Britain but retain their ties to somewhere else. Who believe that embracing a new home doesn’t have to mean abandoning your old one, and are proud to be British-Indian, or British-Caribbean, or British-European. For millions of people in this country, patriotism means being proud of Britain precisely because it’s colourful, diverse, progressive, committed to human rights and to international solidarity. With this speech, the prime minister sneered at their patriotism. And she should be ashamed of it. Well we are now going to be a country where everyone has equal opportunity. Those who avoid taxes we are coming for you. Employers made to employ British Workers, report on how many immigrants they employ. She has even admitted that the poor are suffering because of the financial crisis. Why hasn`t she spoken out against Austerity before. I wonder?Never trust a Tory. A mid twenties, Irish national, with a degree in English and the sum total of 20 months in employment (in journalism) and yet she knows how the UK should be run. Laughable. The first time I saw her (Question Time 1999) I was struck by the nervous energy of one who is using words and language she has learnt by rote, one who had not an original thought in her head. I also detected facial language of underlying cruelty. If we thought Maggie was a bad ‘un……watch this space. She is a right wing fanatic who will be hung by her own words. She has no time for working people and they know it. Only the most stupid of so called ‘moderate’ Labour voters will take any heed of her . Nothing will change for working people under her in fact it will get worse. Her words will be seen as lies. She will do nothing about tax dodgers at the highest level because most of them fund her party, so who is she kidding. So, apart from Brexit, we have the Tories planting their tent on New Labour’s old patch in the centre. Now that is going to cause some serious problems for Labour and its incompetent leadership. Does anyone reading or writing in this publication remember Thatcher? May was a staunch Thatcherite, elected to Tory Council of Merton 1986 (trying to be hunting and fishing brigade then though, no silver perm!) and has been appointed to many positions in the Tory party since 1988. Nearly 30 yrs of right wing chizeling and refining and here we are Thatcher mark 2 as PM. To me she is identikit Thatcher (ism). But Thatcher was supported by the ‘blue collar’ vote – remember the “working class Tory” description. What the blue collar demographic will see is somebody who is claiming to stand up for them – much like UKIP. And in reply, Labour will leap to their feet in anger, and come up with all sorts of sophistry that tells the white working class to remain on the dole and just soak up the benefits. Who is offering hope, and who is offering welfare dependent despair? The whole speech was a tissue of lies. Her voting record in several engagements in cabinet and shadow cabinet show that she believes little of what she said. The only two truths of the whole speech were the undercurrent of xenophobia which finally became writ large and that when she allows her buffoons to Brexit us that everyone will make an eye watering contribution in terms of having nothing in a dead economy. Brace yourselves for a disaster 40 years in the making. No affordable housing, no NHS, no foreign trade of investment, unaffordable energy, schools not fit for educating our people, restricted movement, anyone speaking out being eternally watched and a country of inward looking xenophobes where nobody trusts anyone. Welcome to dystopia! Have many Blairites read “The Ragged Trousered Philanthropists”? What’s Fred’s problem (see above)? Does he think only grumpy ill informed and elderly UKIP voters can comment on politics?